When it comes to Europe, comprehensive data sets and studies on tech entrepreneurship, investment and M&A activity are rare. That is something the Startup Europe Partnership (SEP), a platform meant to stimulate the region’s tech ecosystem that has received backing from several large corporations (Telefónica and Microsoft among others) and education institutions from across Europe, has set out to change. Today sees the release of a comprehensive new study, conducted by Pedal Consulting and Ud’Anet in the framework of the SEP in an effort to map the most relevant elements related to the European startup ecosystem and paint a coherent picture of the state of things. “Startups and scaleups need to be put at the centre of EU policies,” commented Alberto Onetti, coordinator of the Startup Europe Partnership, “but we need comparable data at European	level to identify	and fine-tune concrete actions and strategies”. Enough for us to take a close look at the study, although it’s important to note that the results presented today are based on an interim analysis, and thus only provide preliminary insights and observations derived from a representative sample of over 1,000 ICT startups and 200 M&A transactions. The final report is expected to follow at some point during the first quarter of 2015. Which European scale-ups have raised the most funding? Few surprises here, but here’s a visualisation of some of the most notable ‘scalers’ or scale-ups to come out of Europe in recent times, and much funding they’ve secured to date. Germany’s Delivery Hero, one of the companies that are part of the online food ordering craze, takes the cake in terms of funding raised, with a whopping $635 million secured to date. Based on our own research, likely future additions to this list include Borro, Takeaway.com, BlaBlaCar, Tradeshift, ElasticSearch, FarFetch, Powa.com, Scytl and Funding Circle. Where do Europe’s most promising tech startups hail from? Probably not much of a surprise either, but the answer to that question is the United Kingdom, followed by Germany and France. According to the SEP study, over 25% of the sampled startups is based in the UK, the majority of which are located in London, making the city one of the most important startup hubs in the world. The second country that generates major startups is Germany, with its capital city Berlin. Germany ́s capital, although still a relatively young hub for startup activity, counts as a base for 15% of the startups within the SEP’s database. The third country that stands among the important startup centres in Europe is France, which hosts over a hundred scale-ups. Which are the most active investors in Europe’s startups? In terms of frequency of investing in startups, the biggest contributor is global VC firm Index Ventures, with 56 investments. In second place with 38 investments is relatively unknown but super-prolific German investment firm High-Tech Gründerfonds, followed by Accel Partners with 34 investments. Other familiar names in the list include Balderton Capital, Earlybird VC and Intel Capital. Perhaps more surprising members are Enterprise Ireland and Spanish super-angel fund Cabiedes & Partners. How long does it take for European startups to raise funding? 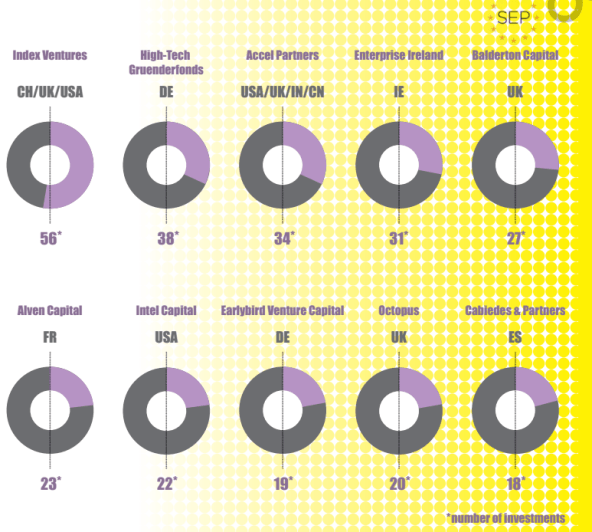 Almost exactly half of the startups and scale-ups in SEP’s data sample was founded in the years 2009-2011. While only 8% of the companies was founded in the 2008 (a year of global economic turmoil), in the 2011 the amount is 2.5x higher. Over 60% of the analysed companies have received the last funding in the ‘seed’ (33%) or Series A (30%) stage. Around 24% of the identified companies underwent numerous rounds of funding and are at Series B stage or higher. Only 13% of companies used crowdfunding, grants or debt financing as their latest source of funding (shown as “Other” in the graph below). There have been a number of large acquisitions of European technology companies in recent times (Autonomy, Trivago, Neolane, Supercell, etc.) and quite a number of them in 2014, as we predicted in the beginning of this year: Mojang, Viber, NaturalMotion, DeepMind, Bull, La Fourchette and so on. According to SEP’s data, the number of exits has been growing steadily since 2011, and the amount of identified exits in 2013 is almost identical to the number of exits identified in the first half of 2014 alone. Also check out our M&A reports for Q1 2014 and Q2 2014! Where do the buyers hail from? Most of the buyers of the above mentioned 2014 exits are American companies, reflecting a broader picture based on SEP’s data sample where 47% of recent acquirers of European tech companies are based in the United States. Unsurprisingly, the US is followed by the UK, Germany and France, three of Europe’s biggest markets and, as indicated earlier, where the main startup hubs are located. Oddly missing are the IPOs of companies like Mail.ru, eDreams Odigeo, AO.com and Materialise. Which are the most popular sectors? Within the ‘ICT’ category, most startups in SEP’s sample fall into the ‘Software solutions’ category (17%), closely followed by ‘E-commerce’ (14%) and ‘Mobile applications’ (10%). The ‘Enterprise Services’ and ‘Advertising/Promotion solutions’ turned out to be equally exploited domains as 18% of all identified scale-ups operate in these two fields. It is also worth mentioning that the ‘Hospitality’ and ‘Gaming’ categories account for 10% of the sample combined. Which sectors does the most funding go to? Most categories’ share of total funding is proportional to the amount of companies operating within these categories. While 18% of the overall funding was raised by the ‘Software solutions’ category, ‘E-commerce’ and ‘Mobile’ took 14% and 11%, respectively. An equal share of capital was split between Advertising and Enterprise services (8% each) as well as among Gaming, Business Analytics and Hospitality domains (6%). Furthermore, considering the average company from each category, it appears that ‘Education’ and ‘Digital Media’ companies get significantly less funding than the overall industry average. 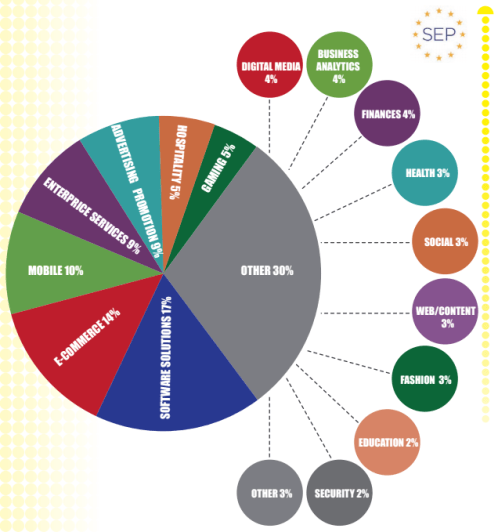 Those are the preliminary answers to key quantitative questions about the European technology ecosystem and startup scene(s). We’ll revisit the study when the final report comes out in Q1 2015.